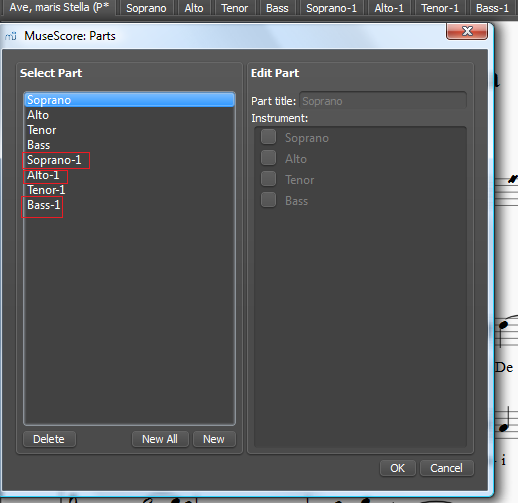 Maybe I'm missing it, but I can't figure out how to reorder the tabs of the parts in MuseScore 2.0. When I created parts on one of my compositions, I forgot the 2nd clarinet part. I went back to the parts dialogue and created it, but now its tab is on the far right after the low brass and percussion. I can't figure out for the life of me how to get it back to the left next to the 1st clarinet part. The only way I can see to do it is delete all of the parts under clarinet 1 in the parts dialogue and then recreate them, which is a major pain. It doesn't affect the score, but my OCD is having trouble dealing with it. Then open again and delete the unnecessary. I guess you can do it that way, but in my case, I've already formatted all of the parts, so I would have to reformat most of them. (In your example you only have 4 parts, I have 15.) It seems like there ought to be a way to change the order in the parts dialogue similar to the way I can reorder the staves using the instrument dialogue. Admittedly, I don't a whit or a whistle about programming, but it doesn't seem like it would be hard to add? Most things about how the GUI works in MuseScore are controlled by a set of libraries called "Qt". Either Qt supports an easy method of doing this or not, but I don't know the answer. I too run into this occassionally - same sort of reason - and it also bugs me. Mostly I live it. In one case, mostly just to see if I could, I saved my score as an MSCX file (uncompressed version of MSCZ, so it's actually just plain text) then loaded it into a text editor and used copy and paste to reorder the scores within the file. This did in fact work, but you have to be at least somewhat comfortable with editing XML files. Qt does support reordering of tabs. It's not really an issue. If we wanted to implement this, I would first do it with up/down buttons in File -> Parts though. Any way to make the tabs draggable? That would solve the problem. So, what's the latest on this? Is there still no way (from within the application) to change the order in which the parts appear in the File...Parts menu? Correct, I don't think anyone has worked on this. It's on the //musescore.org/en/developers-handbook/references/musescore-roadmap}roadmap for future development, for what it's worth. What I found missing with it is that those up/down buttons are always enabled, unlike the corresponding buttons in the album, soundfont, midi-import and instruments dialogs, where they are only enabled if an item is selected and can get moved into that direction. Sample code in ...mscore/albummanager.cpp, line 239 ff if I'm not mistaken. When you say it's been merged, does that mean it's now in the nightlies? Next step, perhaps: ability to rename parts as well as reorder?